Since the last 1970’s, the phrase âreduce, reuse, recycleâ has been a part of the global mindset. We all know why the 3 Rs are important for the environment but we donât always know how to implement them in our day to day lives. This is always the first place to start. It is all about finding ways to reduce the purchaseÂ and consumption of items that are in some way disposable. It could be the item itself is disposable after a single use e.g. paper towel or it is purchased in disposable packaging. Here we are finding ways to clean up disposable products and use them in other aspects of life. The kitchen, the garage, and your car are the best places to reuse disposable products. Most people focus on the recycle portion of the 3 Rs, but recycling has its own baggage.Â Recycling plants need energy to dismantle and re-manufacture the plastic, paper, and other materials they are recycling. As a result, reducing and reusing disposable products is more cost effective, and solves the core issue that recycling is meant to address. If there is less waste to begin with, there is less to recycle. 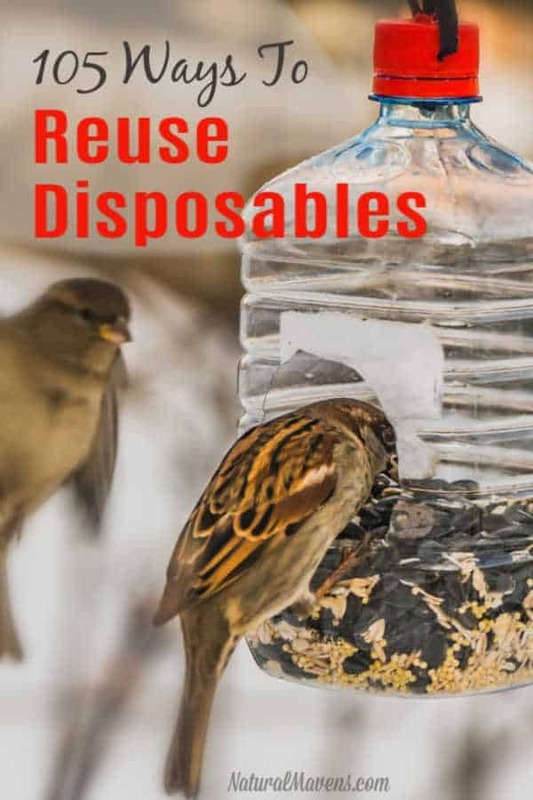 While reducing the purchase of disposables is the perfect place to start, it is not always practical and feasible.Â There is always going to be some items that find their way into your home.Â So the next thing is to look at ways of reusing them. Instead of taking the to-go-cup from your local coffee shop, bring your thermos or favorite reusable cup (this is mine) into the shop to get your morning caffeine jolt. Buy fabric shopping bags to bring your groceries home. Avoid using the paper or plastic option at the checkout counter. Invest in a good quality sports water bottle to decrease your use of bottled water. Letâs be honest, even if you have bought reusable shopping bags, you forget them. So when you have to use plastic bags, keep a stash in your car or kitchen cabinet to use as small waste can liners and emergency shopping bags. Try to reuse them as much as possible before putting them in the bin. Don’t throw out those candle stubs.Â Light them and place on kindling to make starting a campfire easier. When you eat your lunch, don’t throw the bag out! Turn it inside out, give it a rinse and leave it to dry.Â I stick them on the tiles and once dry, they drop off. 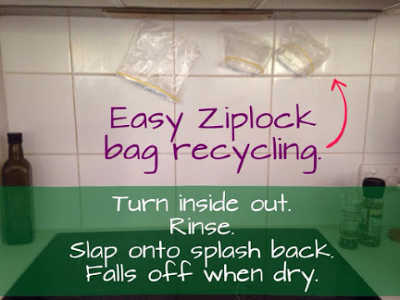 This can save you a lot of money in Ziploc bags as they can be used again and again. If you are a crafty person an old DVD and CD are a great canvas for fun drink coasters. You can cover a disc with fabric, ribbon, or whatever you can imagine. A chilled wet tea bag will aid with puffiness around your eyes. Use one chilled tea bag for each eye. Moving soon? Plastic bags make great cushioning material for your fragile items. Layer the bags into a box and wrap your keepsakes in bags to protect them. You can also use plastic bags to pad mail shipments. Keep in mind that this tip is only for paper egg cartons. Fill the cups with potting soil and plant your seeds, keep it in a well-lit windowsill until the seeds sprout. Then, plant the carton to begin your garden. If you have a large amount of styrofoam to work with you can create your own packing peanuts for mail shipments or your next move. Instead of throwing half-used paint out, melt candle stubs into the can and a pool of wax will harden on top of the paint. When you are ready to use it, pry up the wax top. When you plan to go on a long trip, use a clear plastic bag to encourage moisture buildup. This is especially useful if you donât have anyone to water your plants. After you finish a bottle of spices, clean it up and store small sewing notions, bolts, nuts, and even office supplies.Â You can also buy herbs and spices in bulk and transfer them to the spice bottle for easy use in the kitchen. Have you broken some of grandmaâs china over the years? Well with a Pinterest search you can find inspiration and ideas to make unique and meaningful jewelry. This one is so obvious once you’ve heard it!Â When you finish a roll of wrapping paper, use it to store your Christmas lights for next year.Â No tangles and they are so easy to assemble next time. Do you like to go camping? A fire starter log is simple to make with an empty toilet paper tube and dryer lint. It will make your campfire building a little easier. If you know a frost is coming you can avoid the irritation of scraping it off your side mirrors by covering them with plastic bags. You can also avoid frozen wiper blades by wrapping them in plastic bags before the storm hits. A pair of well-placed rubber bands will keep your slick and flowing tops on the hanger instead of on the floor.Â So simple, but very effective. When you have an old bath towel or sheet that you can read through, just tear or cut it into cleaning rags.Â Keep a ‘rag bag’ to put all these into and you won’t need to buy extra cleaning cloths. Animals like deer, rabbits, and other pests donât enjoy the smell of soap. Fill an old pair of nylons with the small bits of soap left in the soap dish and hang it from a tree in your garden. Stick a wine cork on a skewer and write the name of a plant in your garden on it in marker. Then place it in the soil near the appropriate row. An empty toilet paper roll is a versatile art supply. Donate them to your local school or daycare. When your chalk sticks become too short to write with anymore, then use them to rub down tarnished costume jewelry. An empty tissue box is a great way to package up your plastic bags. Just bundle the bags together and stuff the tissue box. Then you can pull the top bag up to create a pop-up effect. Place the box in a cabinet or attach it to the back of a cabinet door. It is a neater presentation than that ugly hanging plastic bag stuffed with other plastic bags. When a glue stick is finished, just clean it out and pour your melted crayon wax into the casing. When it hardens you will have fun push-up crayons for your kids at a fraction of the price. Wine bottles and beer bottles are the perfect vessels for taper candles. To add a little more character, let the wax drip down onto the bottle. Remember, this only works with a glass bottle. This tip is only for true wine corks, not plastic or rubber corks. Chop up the wine corks to create garden mulch. Most people use a blender to get the mulch consistency. If you have lost the cork to your bottle of wine, a softened candle stub that fits into the neck will work. Small paint cans or empty canned fruits and vegetable cans are ideal for this tip. When you replace your carpet and have pieces leftover, use those carpet scraps as throw rugs. If you are handy with a needle, you can create a carpet work bag by stitching up the sides and sewing the top to a pair of dowel rods. Providing a bag for your customer costs money and some small organizations just donât have room for that in the budget. But when you donate a good quality plastic bag, they can offer a helpful convenience to their customers. You are being ecologically responsible and supportive of your community. Washed popsicle sticks are mixing sticks, plant markers, or craft supplies for your local pre-school. Wrap a thick rubber band around a stubborn jar lid. The rubber will create friction and help you get a better grip. Before you toss out that burnt out light bulb, consider taking up knitting. A light bulb makes a good darning egg. Collect the lint from your dryer to re-stuff that poor abused stuffed animal in your childâs toy box.Â It can also be used for stuffing other small items like drawer sachets or pillows. Needles, straight and safety pins, and other small sewing notions fit well into a lipstick case and it is very portable. If you like a mirror shine in mosaic art, a cut up DVD or CD is a great option. Disc pieces are useful for art and craft projects. Glue the piece to a glass Christmas ornament or press it into clay or cement to shine it up. 40. Donât give up on that empty bottle of nail polish! Yes, a nail polish bottle is hard to clean, but it is so worth it! Cover the brush with cotton or felt and fill the bottle with water. Viola! You have an envelope sealer. Empty paper towel rolls have a myriad of craft possibilities. You can make telescopes, rockets, kaleidoscopes, treasure hunt map tubes, basically, the possibilities are endless.Â You could try these DIY Paper Flowers from Spruce Eats. The wad of cotton some pharmacies put in pill bottles is a nice travel size powder puff for your purse or toiletry bag. If youâve had a miserable camping trip or outdoor adventure, a chilled used tea bag will soothe the pain and itch from bug bites and burns. Fold up potting soil and seeds into pieces of newspaper to plant in your garden. The newspaper will degrade away as the plants flourish. Believe it or not, if you hang a CD or DVD from a tree branch or some other way, the light flash scares away deer, squirrels, birds and other garden pests. Cut out the models in magazines to make paper dolls. Your little fashionista can then create their own outfits for their model or shop around other magazines for other outfits. If your favorite sweater has seen better days, unravel it to collect the yarn. If you are a knitter or crocheter then you can make something new with your beloved wool. They are also great for other sharp or pointy sewing materials like needles and small scissors. Tea can be a very calming scent. If you enjoy the smell of your favorite herbal tea, then consider this option. Cut a hole in the middle of an empty soda bottle and fill it with birdseed. Then hang it up outside to help your little-feathered friends.Â Alternatively, make some holes to insert wooden spoons and make this for visiting wild birds. Broken china can add a little character to your garden. You can create concrete tabletops with a mosaic touch or plan a mosaic pathway outside.Â Build a collection of broken ceramics for bigger projects. If you want to grow some herbs in your windowsill, reach for that old and stained coffee cup. It is easy to move and adds a whimsical touch to your kitchen. Hang on to your used dryer sheets to clean your iron. Just turn your iron to medium heat and run the iron over the dryer sheet. Keep the bag your paperboy uses to package your newspaper. The bag is the right size for your closed umbrella. That way youâre not dripping water on the office floor. Perfect for window gardens too. Empty tissue boxes are convenient trash bins to keep in the backseat of your car. The kids will have no excuse to leave trash or gum on the floors. Egg cartons make the perfect measurement for paints and glue. An egg carton palette is kid-sized and a cheap alternative compared to traditional art supply stores. Twist ties from your loaf bread are versatile tools. Fasten small items like pens together into an easy to find bundle. You can also keep loose shower curtain rings together, as well as tame the maze of cords around your computer desk. You can prevent your metal table legs from damaging your hardwood floor by sliding a foam can holder (can koozie) over the foot. When you finish a roll of wrapping paper, use it as an attachment for your vacuum and add some length to the hose. Youâll be able to clean high ceilings. If your pet has good eating habits and self-control, a 5-gallon bucket is a sturdy feed trough. Cut a hole in the middle of the bucket (much like a soda bottle birdfeeder) and fill the bucket with your petâs dry food. Old toothbrushes are great grooming tools for dirty fingernails. They are also commonly used to clean between tiled surfaces and hard to reach corners. If you have a stray sock or a pair that you can read through, use them as dust rags. Place the socks on your hands and dust your blinds, furniture, and hard to reach corners. Itâs a fun way to include the kids in your housework. Got a book with ruined or torn pages? Create a unique handmade gift with the shell. Hollow out the book and lacquer the edges to harden it. Keep your old pairs of jeans, they can be used as patch material for better, less damaged pairs of jeans. If you in enjoy sewing, use old jeans as material for stuffed animals. Kids love them!Â You can also use to make toys and more your furry friends. When you finish off a bag of apples or oranges, use the bag to tote your kidsâ beach toys around or even the matchbox car collection for a long car trip. They are also good for storing bath toys – pack up the toys and hang the bag over the tap. This tip is for chairs that have cloth seat pads. Remove the pad and you can fill it with succulents and flowers. Whether you need to sort the nuts and bolts in the garage or youâre a crafter and need to keep beads separated for a project, an egg carton meets the need and is easy to store. You can even use the carton lid to label the contents. Eyeglass cases fit well in a pocket. Keep your buttons, bolts, nuts, screws, etc. close at hand. When laundry soap is gone, wash up the bottle and drill holes in the cap. You know have a sturdy watering can. Check with your local wineries to see if they accept used wine corks. If they donât there is an organization called CorkClub. The organization accepts boxes of natural corks and sends a prepaid mailing label when it fits the requirements. Screw a soda can tab down to a picture frame. Itâs easier to hook it over a nail in the wall. Do you have a lot of appliances plugged into a power strip in your home? Well, the plastic tabs you find on a bag of hot dog buns or rolls are useful to remind you which plug is which appliance. Just slide the tab over the cord and write a label on it. If you need to do a quick sweep of a kitchen or shop but you donât have a dustpan, then just cut an aluminum pie pan in half. It will get the job done and it is disposable when you are done. A clean and empty tin can is a handy water bottle holder when you zip tie it to your push mower handle. A cold sip of water is just a tin can and zip tie away. An empty wine box is divided into sections, which makes it perfect for shoes. This is a clever way to get your shoe collection off the closet floor. The next time you change the oil in your car or lawn mower take an empty cereal box with you. Fold the box into a trough and position it to catch the oil and redirect it into a waste pan. The sturdy cardboard cup carriers you get at a coffee shop or fast food restaurant are very useful in a garage or craft room. The sections are good for paint brushes, pencils, screws, washers, and other odds and ends. Get yourself a mesh bag from the craft store and put in those tiny pieces of soap.Â Youâll have a soapy loofah for your next shower. If you layer the bottom of a shipping box with egg carton bottoms you can make sure that special package gets there in one piece. An empty to-go-cup are small water cans for houseplants. Just fill the cup with water, put the slit top on the cup, and tuck it into the windowsill corner till you are ready to tend to your plants. Pill bottles create a neat and orderly display for buttons, needles, beads, and other sewing items like snaps. If you screw the lid of a peanut butter jar to the underside of a wall shelving unit you can fill the jar with nuts, bolts, screws, nails, etc. and you can twist the jar into place. Then the items are at eye level and you have saved space around your work area. If you have problems with blisters after your lawn work, then bubble wrap can help with that. Parmesan cheese cans hold a lot of seed (especially grass seed) and make scattering seeds easier in your garden. Stash your tape, scissors, wrapping paper, and bows in a garment bag and itâs all in the same place and hanging right there in your closet. Attaching a small waste can to your mower and when you find a stray branch during your mowing session, you donât have to stop and leave the mower to move it. Need to seal a bag of chips? Check your closet for those pants hangers you get at the store. Cut the clips off and you donât have to buy another bag clip ever again. Plastic milk crates can be screwed to a wall or stacked up to make shelving units. Instead of the traditional rocks to help with water drainage, packing peanuts will do the same job. Egg cartons are a welcomed donation to small operation farmers. Your egg carton allows them to transport their eggs easily to their customers and keep down costs. If you have holes in your drywall, a piece of chalk just may be the answer. Insert the chalk into the holes and cut them flush with the wall. Problem solved! Keep the water bulb on the bottom of the single stem rose from a florist. Just fill the bottle with a herbicide and stick in the ground. Then push a tip of the vine into the tube and the plant will eventually die. If the glass in your picture frame is broken, keep the frame and staple some window screen material to the backside. Then hang your dangling earrings and slide your post earrings into the screen. Meltdown your broken crayons so you can remold them. You can use lipstick cases, candy molds, and soap molds. A broken brooch or pendant is salvageable if you glue a magnet to the backside. It is a simple way to keep a sentimental piece of jewelry. If you have a damaged tennis racket, just remove the netting and look for a mirror to replace it. Are some of your forks or spoons bent up? How about painting them up and hanging them from a wind chime frame. It makes a cute addition to your back porch. You can cut shapes out of an egg carton lid to dip in paint or trace for an art project. The stencils are washable and reusable as long as the shape stays intact. When you want a unique stamp for your next craft project, use a wine cork. Cut the design in the top of the cork and press it into your preferred colored ink pad. An empty shampoo bottle, when it is cut to make a cradle is a sturdy charging cell phone station. Youâll always know where you laid your phone. When you have to print something at work, print it back-to-back that way less paper is used. Also if you do have a blank back, use the blank space for note taking during meetings. So there you have it, 105 creative ways to reuse disposables. Remember that recycling is a good decision. However, reducing your consumption of disposable products and reusing any good quality disposable items is an even better idea. Try some of the ideas above and hopefully they inspire you to get creative yourself.Â If you’ve got any other ideas, please share them below.